High blood pressure has become an all-too-common problem in America, affecting as many as one in three adults. This is a condition that should not be ignored, as it can lead to an increased risk of heart disease, stroke and kidney damage. At one time, high blood pressure, or hypertension, was relatively rare. That’s not the case today, primarily because of the Western diet, which tends to be heavy in high-glycemic carbohydrates. Carbohydrates break down into simple sugars once they arrive in your stomach, which raises your blood sugar and results in the body producing more of the hormone insulin. This, in turn, leads to the accumulation of fluid and salt in the body that increase body weight and result in high blood pressure. A common misconception is that those with high blood pressure experience such symptoms as nervousness, sweating, difficulty sleeping or facial flushing. Not true. In fact, in most cases, this is a silent disease. If you ignore your blood pressure because you think symptoms will alert you to the problem, you’re taking a huge risk. Know your blood pressure numbers, and how you can best prevent high blood pressure from developing. That’s why it’s important, especially if you’re older, to have your blood pressure checked on a regular basis, even if you feel generally healthy. An ideal healthy blood pressure is around 120/80, with a reading of 140/90 considered elevated. In many cases, if your blood pressure is more severely elevated, say over 160/100, medication is likely to be prescribed. A calculated difference between the systolic pressure, the first number (when the heart contracts) and the diastolic pressure (when the heart relaxes) can also be a sign of a problem. Making lifestyle changes – changes in your diet, such as eating a low carbohydrate diet, and exercising more – are ideally the best ways to reduce your blood pressure. However, blood pressure-lowering medication may be necessary to help patients reduce the risk of a stroke, heart failure or kidney damage caused by hypertension. 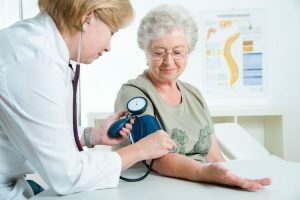 A caveat for elderly people: the risks of medication side effects need to be weighed against the benefits of achieving ideal blood pressure goals. Now that it’s warm out, be aware that while medication can be an effective treatment in reducing hypertension you need to be careful taking it during this time of year. Certain blood pressure drugs (including propranolol and other beta blockers) can reduce the ability of your heart to respond to the body’s need to pump more blood to the skin. This may increase the likelihood of dizziness and lightheadedness as your body tries to respond to the heat. Your body regulates its own temperature by continuously producing and getting rid of heat. For example, when your skin feels hot after being in a hot car, your body cools itself by increasing blood flow to the skin and sweating. Some blood pressure drugs may interfere with these normal processes and cause the body to overheat. This can lead to heart and multiple organ failure. This does not mean, however, that if you’re taking medication for high blood pressure you should choose to stop taking it on your own. Before you do anything, discuss the options with your physician.